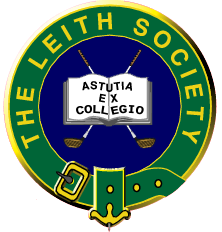 The Leith Society derives its name from "The Leith Code," the traditional name of the first known written rules of golf. The Leith Code was written in 1744 for a competition among the members of The Company of Gentlemen Golfers of Leith (later to become The Honourable Company of Edinburgh Golfers). Their home course was on the Leith Links, named for the seaport town of Leith, which is now a suburb of Edinburgh. The golf course long ago disappeared, but The Honourable Company still thrives at Muirfield. The Leith Code was later adopted by The Society of St. Andrews Golfers, (predecessor to the modern Royal and Ancient Golf Club of St. Andrews) and has evolved into the 34 Rules of Golf and more than 1000 Decisions on the Rules of Golf that we know today. Despite the inevitable evolution and increasing complexity of a 13 rule code over 250 years of play, a respect and admiration for the simplicity, principles, and history behind, The Leith Code attracted many rules officials and interested rules "amateurs" from around the world to engage in discussion and scholarship which would help them understand more fully The Rules of Golf and their underlying principles. To that end, The Leith Society was formed on January 1, 2001. The Leith Society has several goals. The first is the consolodation and modification of two primary rules discussion boards currently on the internet, with the intention of satisfying several discussion objectives: easier access to all resources; answers to day-to-day rules occurances; the origins of rules and their interpretation; the principles and theory behind the rules; and discussions of problems encountered by officials on the course. The Society also plans to provide access to rules research materials, to the extent allowed by copyright laws. A portion of this goal is already met by John Hutchinson's growing collection of former R&A versions of the rules, going all the way back to The Leith Code itself, which he has kindly consented to add to our resources. A link to his site is on our menu. N.B. The Leith Society has no role in the development, writing, or enforcement of The Rules of Golf. The Society welcomes participation in the discussions and use of its facilities by officials and members of The Royal and Ancient Golf Club of St. Andrews, The United States Golf Association, and other organizations involved in drafting and administering The Rules of Golf. However, nothing the Society does should be construed to be sanctioned or approved by any of those organizations.